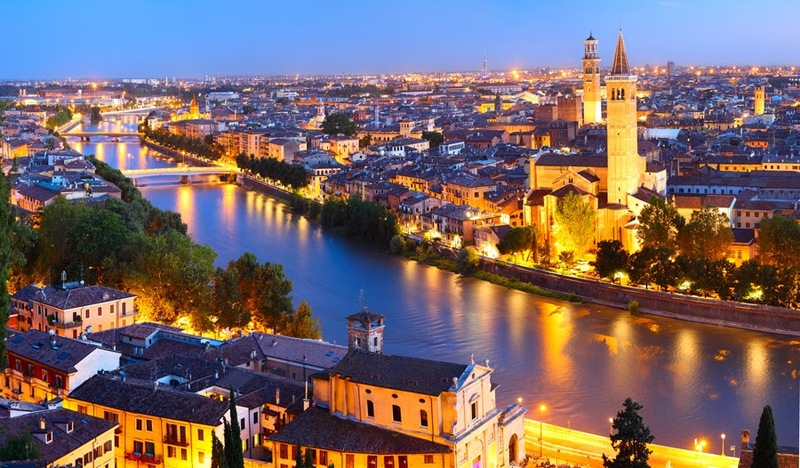 Italy is renowned for being romantic with its beautiful countryside, the tall, dark, handsome men, and the rambling historic towns with their old romantic traditions. When Shakespeare wrote about his tragic young lovers, Romeo and Juliet, he forever linked Italy with romance in the hearts and minds of people all over the world. Italian couples traditionally celebrate La Festa Degli Innamorati, Valentine's Day, like lovers all over the world, by exchanging Valentine's cards and going out to share a romantic dinner. The man will often give his sweetheart a gift of red roses, perfume or chocolates. Baci chocolate candies with a shiny red wrapper and a sweet red cherry center are produced specially. These chocolates contain a romantic quote inside the foil wrapper. The history of Valentine's Day has its origins in Italy as well. In the Roman Empire, February 14th was a holiday to celebrate Juno, the goddess queen of women and marriage. Valentine’s Day is also linked to the priest, St. Valentine. He defied the Roman emperors’ order banning soldiers from marrying during wartime and secretly wed them to their sweethearts. Now the romantic Italians have started another tradition for lovers, Lucchetti dell’Amore or Locks of Love. Young lovers write their names on a padlock. They then secure it on a bridge or railing and throw away the key as a sign that their love will last forever. There are different accounts of when this tradition started. Around the time of the Second World War, young people from Riomaggiore and Manarola, two fishing villages in the Cinque Terre on the Italian Riviera, started attaching padlocks to the fence of the coastal footpath between the two villages. They then tossed the keys into the Mediterranean. 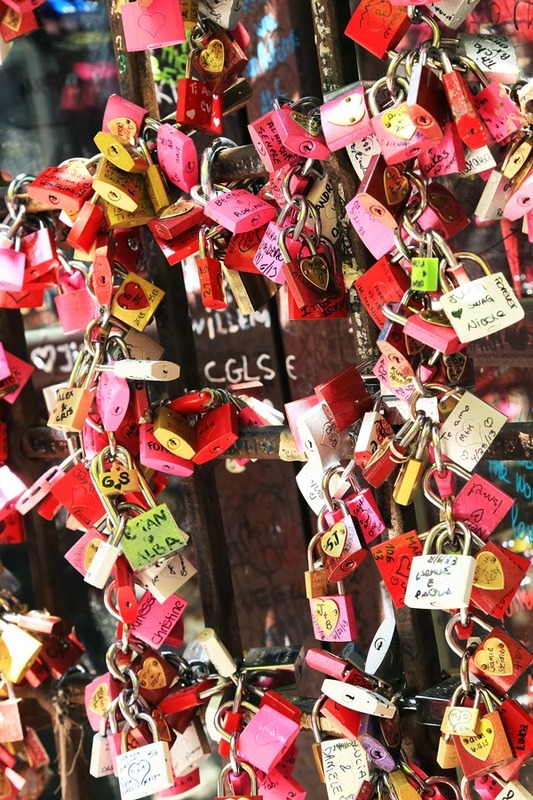 Nowadays, these locks of love are found all over Italy, often on bridges spanning rivers. They adorn bridges in Rome, Venice, Verona (pictured) and Florence. The authorities have started to remove them from places of historic beauty like the Rialto bridge in Venice. In Florence police removed more than 5000 locks from the Ponte Vecchio. But the romantic Italians will not be stopped. This craze has now spread across Italy into other European countries. The Lucchetti dell’Amore, Locks of Love, sound like a wonderfully romantic idea in theory, but I can imagine they might become a problem for the Italian authorities. Do you know of any unusual Valentine's or lover's traditions? Helen lives in South West England near Plymouth in Devon between the windswept expanse of Dartmoor and the rocky Atlantic coast. As well as her wonderful, long-suffering husband, she shares her home with a Westie a Shih Tzu and a burmilla cat. Helen's latest book is a Valentine's story! The Army Doctor's Valentine's Baby is #5 in her series. Find Helen on FaceBook and Twitter, or visit her website. I love romantic traditions like this. In Finland Valentine's Day is called "Ystävänpäivä", which means "Friend's Day". Unlike many other countries where Valentine's Day is mainly a day of "Romance", in Finland it is also the day when close friends send cards and gifts to each other. That's nice, to make it a day when friends share gifts and cards as well. Thanks for finding this! How very interesting. Personally my dh prefers a meatier valentine gift --so I bought filet mignon for Friday! Sounds tasty. I enjoy steak. I'm going out for the day with my husband on Valentine's Day. He was travelling to somewhere I want to research so it worked out well. Hope you have a lovely day on Friday. What passion! I don't think I can match that. It is a wonderful idea, isn't it. I actually used the padlocks in a story set in Italy a few years ago. I hadn't heard it had grown into such a popular thing in Italy. I wonder how long before you start seeing padlocks everywhere in the USA? I've seen that. Love you picture above. Margaret, did you see it in Italy, or somewhere else? Very interesting. I went to Italy several times but didn't know about the Lucchetti dell’Amore tradition. Maybe because I always go in summer. In the Eastern block and Russian countries, they celebrate Women's Day on March 8, where the men honor their women, wife, mother or lover. It's interesting how a celebration of women seems to have turned into Valentine's Day in Italy. I bet they have some interesting traditions in Russia. I've only been to Italy a couple of times. Would love to go again. I have a few Italian cities on my wishlist of places to visit. Near the top is Venice. I'd also like to go to the Cinque Terre and walk the coastal footpath to all the five towns. Interesting post, Helen! Thanks so much. Thanks for stopping by. There are so many interesting traditions surrounding our holidays and celebrations that we don't know about. I really like the locks of love idea! Cute idea, isn't it? I can understand how it is running out of control now, though.